There's been no shortage of airline uniform news over the past year. Just last month, Alaska Airlines unveiled its new uniform redesigns, which everyone loved. Earlier that month, American Airlines announced it was partnering with a new uniform supplier (in the hopes of avoiding any more rashes and hives). And in May, Southwest Airlines showcased its new uniform looks. Now, Delta Airlines revealed its new Zac Posen-designed uniforms, and they are being described as everything from "athleisure in the sky" to "high fashion." The new uniforms will debut on the ground and in the air on May 29, 2018, but this redesign has been a long time coming. Delta Airlines employees haven't had new uniforms in over a decade, and this redesign took three years to reach fruition. 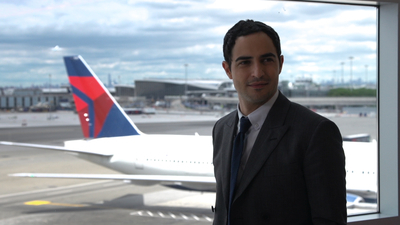 Designer Zac Posen has had plenty of experience creating red carpet gowns, but airline uniforms were a new venture for him. To make sure he did the job justice, he did a lot of research. Posen flew routes, served coffee and food, and even worked as a gate agent. It seems like the hard work paid off. This collection is the perfect combination of functional, fashionable and classic. The uniforms continue to feature iconic pieces like Delta's red coats, but they added a new color to the uniforms: Passport Plum (a similar shade to Pantone's Color of the Year). The uniform fittings were very comprehensive as well. The company hired local fitters with fashion or design backgrounds, and trained them on how the uniforms should fit employees. Then, each employee was given a personalized fitting the day before ordering their new uniforms. Each uniform comes in more than 30 different sizes, including regular, petite, curvy, long and short cuts. Posen even teamed up with Lands' End to make sure these uniforms are also durable. We think Posen's collection is a great look for the airline, and we think these flattering and functional looks might transform airline uniforms forever. Is Bulletproof Clothing Going Mainstream?